Successfully Added Flashing Finger Beam LED Light Set (Red + Green + Blue + White) to your Shopping Cart. 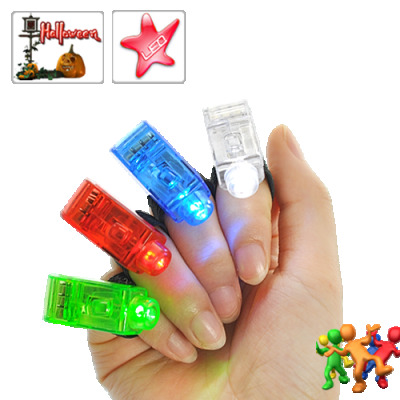 Be the life of the party with this Flashing Finger Beam LED Light Set. Each set of these flashing finger beam LED lights come with a red, blue, green, and white LED light that easily fits over your finger. Use all 4 together to create an amazing light show while you dance and move around, or use one at a time just for fun. This Flashing Finger Beam LED Light Set can be a great entertainment prop for parties, bars, KTV, and other festive gatherings. Once the lights go out, take these out and start getting ALL the attention. Wow friends, generate laughs, be awesome. This Flashing Finger Beam LED Light Set is available in our warehouse now for single or bulk orders. But be warned: Due to limited stock, once this item sells out, we will not be restocking. So get your orders in now! These flashing finger lights need to be moved quickly in the air in order to produce the effects pictured. The batteries are not replaceable once they run out. We also do not offer any returns.